This masterful synthesis explains how Africa has come to be a land torn by incessant conflict among its impoverished peoples and countries, a continent living through the gravest social revolution of its history, experiencing the world's fastest demographic growth. 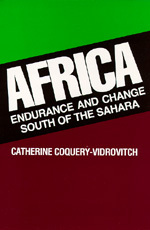 Weaving together four major themes—population, political power, the peasantry, and the new growth of the cities—Coquery-Vidrovitch demonstrates the need to recognize the extremely complex heritage of African societies if one is to understand the present or act upon the future of the continent. Catherine Coquery-Vidrovitch is Professor of History at the University of Paris. She is the author and editor of numerous books on historical and contemporary Africa.